It all started with Madonna, says Michael Griffiths. The award-winning Australian cabaret performer has been touring Fringe festivals with his tribute acts since 2014. His new show Songs by Kylie traces the pop princess’s rise from Neighbours to music superstardom, and it’s coming to Fringe World 2019. Ahead of the show, Griffiths took some time to answer Seesaw’s Q&A. Michael Griffiths: I fell in love with pop music at a very early age and grew up playing the piano by ear. Music has always been my first love but actually being on stage came a little later, more in my late teens when I started doing amateur musicals for fun, in my hometown Adelaide. MG: I trained in music composition in Adelaide first, before deciding that being in musicals looked like a far more glamorous means of employment. 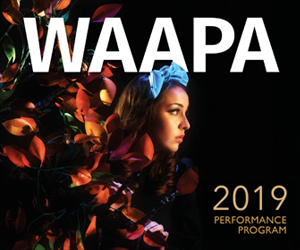 So I made the big move West to study at WAAPA in the late 90s. I then worked solidly in musicals for about 15 years, in a string of jukebox musicals – SHOUT!, We Will Rock You!, Priscilla and Jersey Boys – and that’s where I really developed my skills. Cabaret is a newer venture and one which I’ve learned strictly on the job. The best part about it is being reunited with the piano after many years of neglect. There were about ten years where I barely touched one and decided I could no longer play. MG: I’m a travelling cabaret performer with a bunch of shows under my belt and have been on the Fringe circuit for over six years now. It all started with a Madonna tribute which I performed in Perth in 2014, followed by tributes to Annie Lennox, Cole Porter and Peter Allen. I’m inclined to steal Barry Humphries’ line and say that I’m “in the business of cheering people up”. MG: I love arriving in an old theatre with charm and history. They are very special places and I never tire of them. But at the risk of sounding super corny, making people happy is the best part about what I do. MG: Performing at London’s Royal Albert Hall, on Elton John’s piano with a mirror ball from Kylie Minogue’s Christmas party, wins hands down. MG: Corporate gigs sometimes don’t go so well and I usually try to avoid them. I sang at a car yard launch – why on earth did I say yes to that? – a few years ago and it was like pulling teeth. MG: I’ve been Carlotta’s music director the last couple of years and have never laughed so much on stage. She’s a living legend and gets away with absolute murder. S: What made you decide to come back to Fringe World? MG: I’ve been coming to Fringe World since 2014 and it’s always such a treat to be back in Perth. I lived on Beaufort St, Mt Lawley in the 90s before it was “zhuzhy” and Perth has been a second home to me ever since. Summer is the best time of year and I adore Perth audiences – they’re very generous and always up for a good time. MG: I explore the back catalogue of Kylie Minogue, starting out with her time on Neighbours doing the “Locomotion”, teaming up with “hit factory” Stock, Aitken and Waterman, going it alone to find her own voice and her rebirth as the ultimate disco diva. The early songs are such guilty pleasures and so much fun to sing; they always put a big smile on my face. I re-imagine quite a few familiar songs too, so if you’re a Kylie fan like me, there’s some surprises in store. Some songs, such as “Better The Devil You Know”, are pop perfection and you don’t mess with them. You can catch Michael Griffiths: Songs by Kylie at De Parel Spiegeltent @ The Woodside Pleasure Garden, January 29 – February 3.